Ferrari's dominance increased at the fast, sweeping Spa circuit as it claimed the first four places in the Belgian Grand Prix. Phil Hill got the better of Wolfgang von Trips this time, but only just, crossing the finishing line less than a second ahead of his team-mate. On his first practice lap, British driver Cliff Allison crashed and overturned his Lotus, breaking both his legs and suffering severe shock. His injuries forced him to retire soon afterwards, ending a promising grand prix career that was dogged by terrible bad luck. For the second race in succession, the Ferraris claimed the front three places on the grid, with local guest driver and Le Mans winner Oliver Gendebien in fourth, his privately-entered car painted in the Belgian racing colours of yellow. 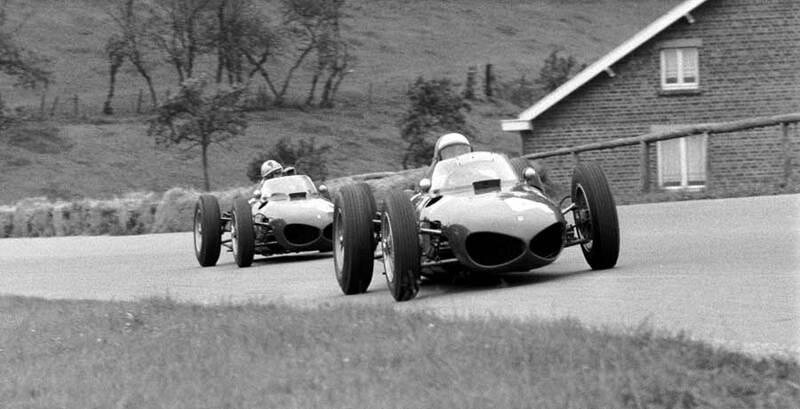 However, it was Graham Hill in a BRM who led the field of 21 cars into the first corner, but his lead was short lived as Phil Hill swept past him before the end of the first lap. On the second lap, to the delight of the partisan Belgian crowd, Gendebien took the lead, but he soon succumbed to the greater power of the newer 120-degree engines of Hill, von Trips and Richie Ginther and slipped back to fourth. By the 12th lap, the Ferraris were in complete command and were unchallenged for the remainder of the race. Behind them, though, a terrific tussle was taking place between John Surtees and Graham Hill for fifth. They swapped positions no less than eight times until Hill was forced to retire on the 19th lap with ignition problems. Phil Hill and von Trips contested the lead throughout, and it was not until the 25th lap that Hill went ahead and stayed there. The British cars were simply outclassed by the V6 Ferraris and, on the fastest road circuit in Europe, the gap was particularly pronounced. This result put Hill on top of the world championship standings with 19 points, one ahead of von Trips, with Ginther and Moss equal third with 12 points.